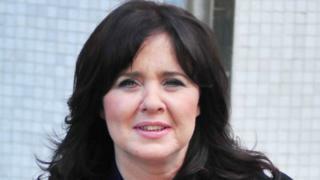 Coleen Nolan has said she is cancelling all her work commitments following her on-screen row with Kim Woodburn on Loose Women. Nolan will not appear on Loose Women until further notice and her solo tour Never Too Late is being postponed. A statement on her Twitter account said she is "devastated" to let people down. But said she is "not strong enough to withstand... constant and unfounded online abuse". The statement adds she will be taking an "immediate hiatus" and spending time with her children and family "where she feels loved and respected". Nolan had already dropped out of an appearance on Thursday's Loose Women, writing on Twitter that she was "still very upset about everything that's happened". When she appeared on Tuesday's This Morning to talk about the tour, Nolan cried when she was asked about the argument. She said there was a campaign to get her fired from the show and that she'd been sent "revolting" messages. Woodburn had been invited on to Loose Women to reconcile with Nolan after they fell out on a previous series of Celebrity Big Brother. However it ended in a row and Woodburn became tearful and stormed off set after clashing with the panel. Nolan said the row was "ugly, upsetting and unpleasant", adding that she she wished she could turn back time and undo it. But, she said: "Anyone that knows me knows I'm not a bully. That would be the most hurtful thing people could call me." Thursday's statement says she has experienced "constant online bullying, trolling, and misrepresentation of her words, actions and re-actions". "Coleen has spent 50 years in show-business and 18 years as one of the most loved members of the Loose Women panel, and has never been subjected to such a horrifying torrent of online abuse or such a heart-breaking attack on her reputation. "She sends her love to everyone who has supported her and knows who she really is and plans to return when she feels stronger."